DR. RESIL B. MOJARES, Professor Emeritus, was director of the Cebuano Studies Center since its founding in 1975 until 1996, when he assumed the directorship of San Carlos Publications. A distinguished professor in Literature and History, Dr. Mojares has a bachelor’s degree in English, a master’s degree in Literature and postgraduate studies all at the University of San Carlos. His doctorate in Literature is from the University of the Philippines in Diliman. A noted writer, critic and cultural researcher, he has won several National Book Awards from the Manila Critics Circle for works in literary criticism, local and national history, urban and rural history, and political biography. Mojares has received the Free Press and Carlos Palanca prizes for his short stories, a fellowship from the UP Creative Writing Center, and teaching and research fellowships from the Ford, Toyota, and Rockefeller foundations, Fulbright Program, and Social Science Research Council (New York), and two prizes from outside the country: the Grant Goodman Prize for History from the Association of Asian Studies, and the Fok Ying Tung Southeast Asia Prize for his contribution to the development of civilization, culture and science in Southeast Asian countries. He has also served as visiting professor or fellow at the Universities of Wisconsin, Hawaii, Michigan, Kyoto University, UCLA, and the National University of Singapore. He received a Centennial Award for Cultural Research from the Cultural Center of the Philippines. Dr. Mojares continues to write scholarly books like The War Against the Americans and Brains of the Nation, and is finishing a definitive provincial history of Cebu. He has served in numerous professional organizations and selection committees here and abroad. 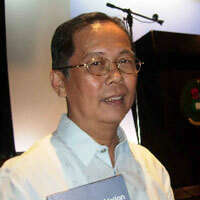 At present he is General Editor for the biographies of Ramon Magsaysay Awardees. DR. ERLINDA KINTANAR ALBURO, was director of the Cebuano Studies Center from 1996 until 2011 where she directed research in Cebuano culture. Since taking over the position from Dr. Resil Mojares in 1996, she has also directed the Cornelio Faigao Memorial Annual Writers Workshop of Cebu, and has served as panelist in workshops in Iligan and the Iyas of Bacolod. She is a teacher, researcher, cultural worker, heritage advocate, feminist and writer. Since 1965 she has taught courses in language, literature, folklore and research. She was visiting professor at the University of Hawaii and the Fu Jen University of Taiwan, and has lectured in universities in California, Illinois, Michigan, Arizona, Texas and New Mexico. Two of her publications were shortlisted for the National Book Award: Sumad and Dictionary of Bisayan Arts. She has written numerous journal articles and edited various anthologies of Cebuano literature for the NCCA, the Cebuano Studies Center and the Women in Literary Arts – Cebu. 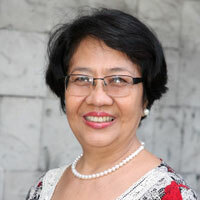 She has served or still serves as head, adviser, founding member andéor board member in national professional groups in Philippine Studies, History, Anthropology, Literary Research, and Cultural Research; as well as in local groups like Women in the Literary Arts – Cebu, the Akademiyang Bisaya, Hamiling Binilin and the Creative Cebu Council. Before her current term as Execon member of the Historical Research Committee of NCCA, she was regional coordinator for several terms in the Literary Arts Committee (since when NCCA was still PCCA, the Presidential Commission for Culture and Arts). For consistently promoting Cebuano culture she was featured among Cebu`s women achievers by the SunStar Publications in 2007. Her poetry was included in the exhibit of the International Women`s Poetry Festival at the Library of Congress in 2008. Recently, her accomplishments were recognized in the 1st Taboan Literary Arts Award given last 12 February 2010 at the Casino Español de Cebu.